With the assistance of our skilled and dedicated professionals, we are instrumental in offering Concrete Cover Block. 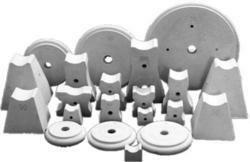 Concrete spacer used in vertical and horizontal applications which offers two / three covers. Spacer Knee - Femoral 58 mm with 64 mm tibial.Spacer Knee - Femoral than 65 mm with 71 mm tibial. To furnish the diverse requirements of our clients in the best possible manner we are involved in offering an extensive range of Concrete Spacers. We are amongst the reputed organizations, highly engaged in offering an optimum quality range of Concrete Cover Block. It is used in beam bottom and side wall column. We are a reputed entity, engaged in manufacturing a qualitative array of Concrete Spacer. We are counted among the well-reputed firm for offering a wide range of Concrete Block to our esteemed patrons. With the assistance of our professionals, we have been able to manufacture and supply a wide range of Concrete Spacers. These blocks are manufactured by our professionals using supreme grade raw material and latest technology in compliance with international standards. Our valuable clients can avail these cover blocks from us in various specifications at the most affordable price range.